The two areas of online transaction processing (OLTP) and online analytical processing (OLAP) present different challenges for database architectures. Currently, customers with high rates of mission-critical transactions have split their data into two separate systems, one database for OLTP and one so-called data warehouse for OLAP. While allowing for decent transaction rates, this separation has many disadvantages including data freshness issues due to the delay caused by only periodically initiating the Extract Transform Load-data staging and excessive resource consumption due to maintaining two separate information systems. We present an efficient hybrid system, called HyPer, that can handle both OLTP and OLAP simultaneously by using hardware-assisted replication mechanisms to maintain consistent snapshots of the transactional data. HyPer is a main-memory database system that guarantees the ACID properties of OLTP transactions and executes OLAP query sessions (multiple queries) on the same, arbitrarily current and consistent snapshot. 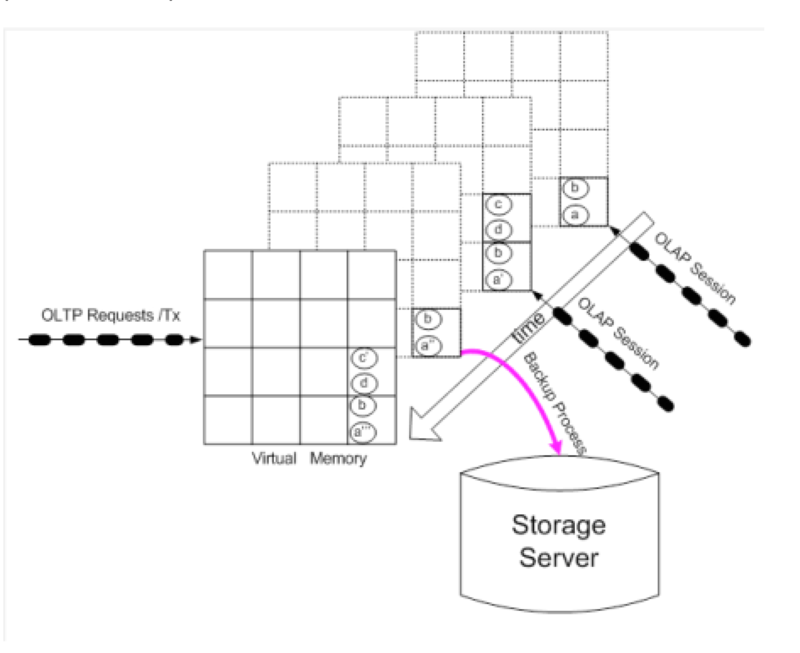 The utilization of the processor-inherent support for virtual memory management (address transalation, caching, copy on update) yields both at the same time: unprecedented high transaction rates as high as several 100,000 per second and ultra-low OLAP query response times of as low as 10 ms – all on a commodity desktop server. Even the creation of a fresh, transaction-consistent snapshot can be achieved in 10 ms. The performance evaluation of the HyPer prototype is based on the standardized TPC-C benchmark. This benchmark “simulates” a sales order processing (order entry, payment, delivery) system of a merchandising company. The benchmark refers to the core functionality of a commercial merchandiser like Amazon or Würth. In addition, the benchmark incorporates the query suite of the TPC-H benchmark – rewritten for the TPC-C database schema. Thereby, the two most prominent benchmarks for OLTP (TPC-C) and for OLAP (TPC-H) run in parallel on a single HyPer installation and produce unprecedented performance.